Wednesday saw the team back on the Left Bank, with the focus on St Julien and Margaux, tasting at Châteaux Beychevelle, Branaire-Ducru, Ducru-Beaucaillou, Angludet, du Tertre and Giscours, d’Issan, Brane-Cantenac, Rauzan-Ségla, Margaux and Palmer. What has emerged is helping to further define our understanding of this complicated but fascinating year. The 2018 vintage is marked by two meteorological halves: persistent rain through the spring until mid-July, and then an unblemished, rainless summer of hot days and cool nights. Ultimately each château’s wine has been defined by decisions taken on how and when to combat the mildew attacks that peaked in June, and when to harvest, given there was no time pressure due to the seemingly unending summer. The latter is an uncommon luxury for producers, and it left many asking themselves the question: just how ripe do I want my grapes? The advantage of a later harvest is that all the tannins – in the skins, pips and stalks – are able to achieve exceptional ripeness, but that can come at the expense of acidity. There seem to be two schools of thought this year: those that felt they could achieve greater phenolic ripeness without unduly increasing sugars or diminishing freshness, or those that valued acidity over the extraordinarily rich textures available to those who waited. Therein beats the heart of this fascinating vintage. At Branaire-Ducru, Jean-Dominique Videau told us there was little to lose by waiting for more ripeness, whereas Henri Lurton at Brane-Cantenac said the preference was to harvest as soon as the grapes were ready. Both châteaux have produced excellent wines, but Branaire is the much plumper of the two, although not at the expense of the château’s intrinsic personality. Another defining characteristic of the vintage, on both Left and Right Banks, is the quality of the Merlots. Time and time again we have heard that such quality and perfect health was unprecedented, but this variety always has a short window of perfect ripeness. Those that dallied and held back their pickers until the later-ripening Cabernets were also ready, have often lost detail in their wines. Lastly, the opportunity to harvest well into mid-October has produced some very intense Cabernet Sauvignons. The dry summer created small berries, at least 10% smaller than usual, and with very thick skins. 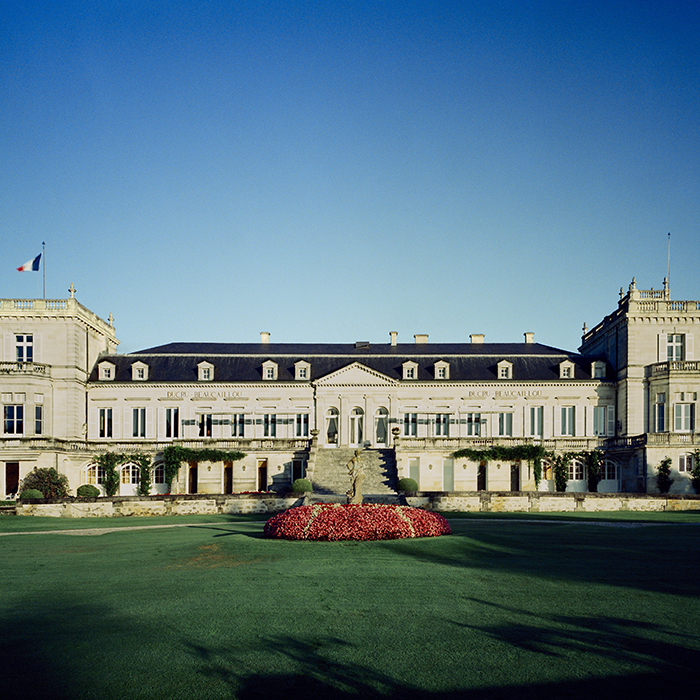 At Château Margaux, Aurélien Valance revealed that one plot of Cabernet Sauvignon that has always been a mainstay of the Grand Vin was deemed too powerful this year, and was relegated to Pavillon Rouge – but to striking effect. Choosing the right moment to pick the Cabernet Sauvignon is generally the final key to the style of most Left Bank wines this year. Picking early enough to preserve some bite and lift to the palate, as at Giscours, Du Tertre and Brane-Cantenac, has preserved definition and focus in the wines. The wines from later harvests, such as at Ducru-Beaucaillou, are joyously hedonistic. A final word for Petit Verdot, always a bit player in Bordeaux: this is another late-ripening variety and so revelled in 2018’s long summer. It is to be found playing a more important role this year at several châteaux, including Beychevelle, Giscours and especially at Angludet, where its savoury notes are more to the fore with 18% of the blend. Poor Ben Sichel at Angludet lost all of his crop last year to frost; this year June’s mildew robbed him of 90%, but luckily the plucky Petit Verdot allowed him to make at least some wine, indeed a wine that is amongst the freshest and brightest in its appellation. That contribution is also evident at the other châteaux that have used this variety with intelligence. Sadly it must be noted that Palmer was also hit savagely by the mildew and only 11% of the crop could be salvaged. A complicated year indeed. Mark is reporting from Bordeaux all week; read all our coverage of Bordeaux 2018 here.